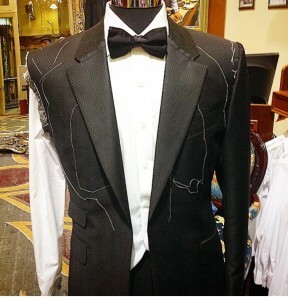 This Tailored Garment is 50% Constructed on First Fitting and requires 2 Fittings. Hand Made in The Block Arcade. Our tailor made suits are very unique in Melbourne, Australia. We’re dedicated to making garments that fit individuals perfectly so they help you to have great presence. 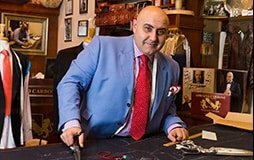 We do not discriminate against any body shape male or female, so if you are interested in a custom made garment that fits you like a glove, Adriano Carbone is your best choice. To create a Tailor Made Suit, Adriano starts by taking measurements and a few photos. They will assist him in cutting out your hand crafted garment. In the next stage, the garment is 50% constructed and presented to you for your first fitting, so adjustments can be made to give you that that perfect fit feeling. A few weeks later, the garment is presented to you for your final fitting. Below are the options of the different styles Adriano can use to create your garments. He’s available to offer his expert advice with all choices. Tailored coats are either single or double breasted. Vents are slits or openings in the bottom and back section of the jacket. With Adriano’s suit jackets, you can choose between no vent, a centre vent or side vents. When creating your suit pants, you can choose between three styles including flat or pleated fronts. For the pockets on your coat, you can choose between the below styles. There are four options for trouser pocket styles. Lining is available in any colour you choose. Our Tailor Made suits are 100% handmade in the Melbourne CBD at our location in The Block Arcade. We can create tailor made garments for all occasions whether it’s a suit, refer jacket, overcoat, trousers, dress shirts, sports coats, skirts, dinner suits, tailcoat, morning coat, or formal attire. Speak with Maria or Adriano about what style of tailor made garment you’d like handmade in the heart of Melbourne.